As written on my homepage, the EU has published a new document “Developing a European Union Policy towards the Arctic Region: progress since 2008 and next steps”. The EU summarises the new strategy in three words, ”knowledge, responsibility, engagement’. The introduction to the paper states:As climate change and economic development accelerate in the Arctic region, the European Union should step up its engagement with its Arctic partners to jointly meet the challenge of safeguarding the environment while ensuring the sustainable development of the Arctic region. Nowhere is climate change more visible than in the Arctic, which is a vital and vulnerable component of the Earth’s environment and climate system. The melting of the Arctic sea ice is progressing rapidly, resulting in self-accelerating global warming, and affecting ecosystems as well as the traditional livelihoods of indigenous peoples.” The “Joint Communication” of the Commission and the High Representative of the EU for Foreign Affais and Security Policy sets out the case for increased EU engagement in Arctic issues. It follows an application by the European Commission on behalf of the EU for permanent observer status. 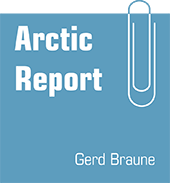 The policy paper is accompanied by two working documents, “The inventory of activities in the framework of developing a European Union Arctic Policy” and “Space and the Arctic”.